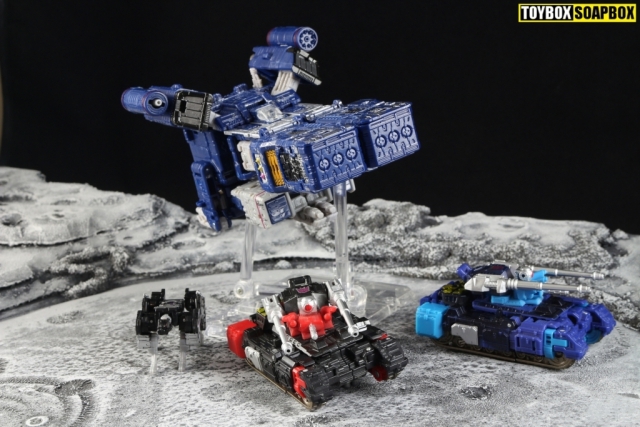 Only last week I was sat here lamenting how slow it was taking the second wave of Transformers: War For Cybertron Siege to arrive onto our Great British shores. Thanks to Kapow Toys that drought is slowly turning into a life-giving spring. 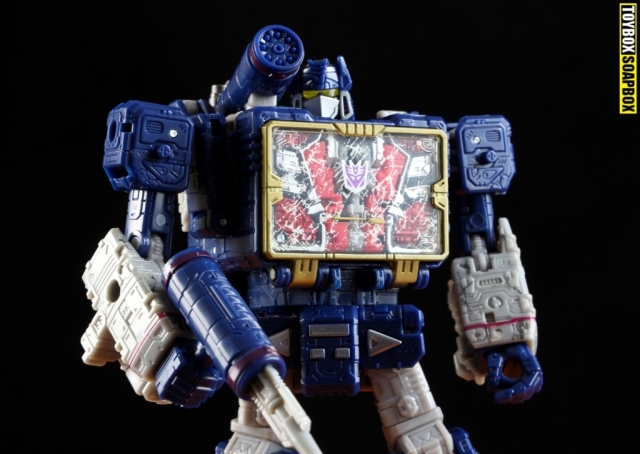 Not only do we have the second wave of Micromasters and Cassettes, but the baddest kareoke machine in the galaxy has also finally decided to put in an appearance, that’s right – Soundwave. 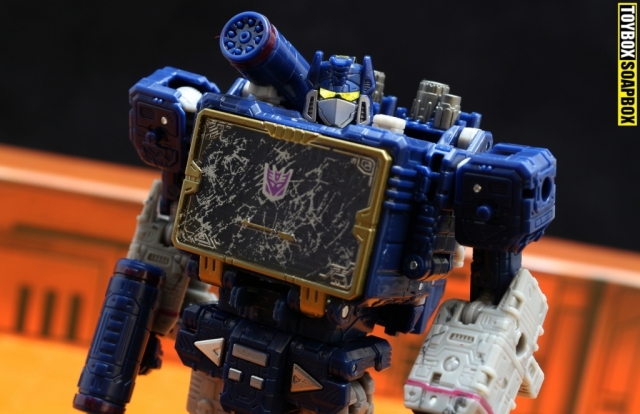 As one of the most iconic and well remembered Transformers characters, Soundwave tends to show his face in almost every single corner of the Transformers franchise, but it is his Generation 1 incarnation that is by far his greatest and most remembered appearance (hush, Transformers: Prime fans). There was something about him that went beyond just simply looking cool. He turned into a regular household item in the form of a cassette deck, which most kids had and he was also compatible with other toys in the line, giving him a play value few others possessed. Even his fictional game was strong with him also somehow managing to not only survive the great Autobot/Decepticon culling of 1986 – but further expand his minion ranks with robot bats and dinosaurs. The guy just has that special something. Now he has a brand new, hotly anticipated toy – so lets take a look and see if it is truly “superior”. Siege recasts Soundwave from a tape deck to a dropship, and whilst it might not be the sleekest vehicle mode you’ll ever see it’s fun and plays to the utilitarian nature of Soundwave. Never one to strike you as being about flash, he is purely about the cause and what he can bring to it. 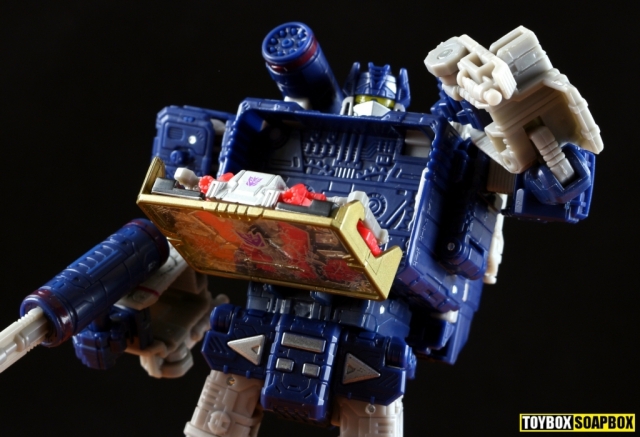 His most iconic feature was his ability to eject tapes that turned into robots from his chest, so it makes some degree of sense that troop deployment would form the core of his pre Earth Cybertronian form. He might not be carrying a copy of Frampton Come’s Alive in his chest anymore, but acting as the infiltration tool to ferry his minions into hot zones makes a lot of sense. He’s doing something to aid the Decepticon cause, and it’s something that ties into his G1 gimmick. As far as blue slabs go it is covered in a lot detail, with most of it suggesting audio functionality including a small aerial that flips up from inside his torso, just to further accentuate this link to his past. I bet he still can’t tune in Channel 5. In terms of features there is obviously the spring-loaded door which is used to eject any of the compatible tapes. But you already knew that. Currently you are limited to Ravage and Laserbeak but hopefully we’ll see more of the tape minions before the line signs off. Only one tape can be stored at any given time, as the cavity behind the chest compartment is used to store the robot modes head. 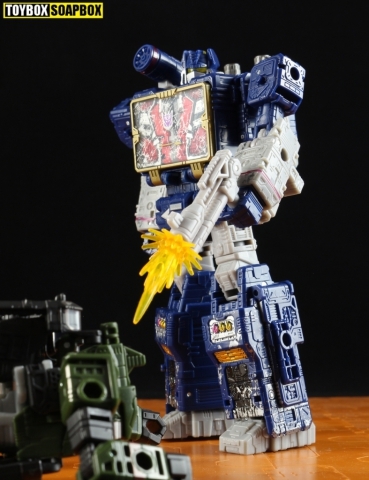 As is the standard for Siege the figure is decked out in pegs and ports, so you can use any of the weapon effects parts that come with the Battlemaster figures. 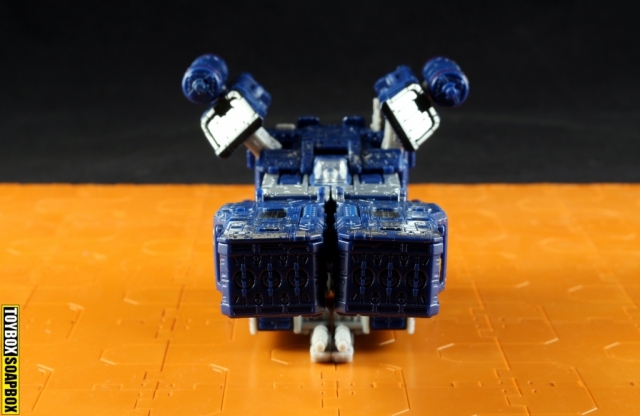 A tiny cockpit sits on top of the jet mode (amusingly it’s also Soundwave’s backside in robot mode) but it is so small even The Borrowers would have trouble getting in there. You get the impression that even though this is the default alternate mode, the designers have built it in the knowledge that most collectors will be desperately attempting to fan mode a tape deck. At the core of Soundwaves personality is the art of deception. He is the embodiment of the Decepticon ideal, a zealot totally wrapped up in a cult that he has allowed to consume him. What he brings to this nefarious table are his infiltration skills and they require a better disguise than a flying brick. In the distant future of 1984, that path will lead him to take on the shape of his signature cassette deck, but millions of years in the past on Cybertron – he picked a lamppost. Perhaps it is due to being one of the rare instances where we saw a Cybertronian mode, but for a makeshift form that only shows up for about three seconds in the opening episode of the original cartoon it’s amazing how often it’s referenced. 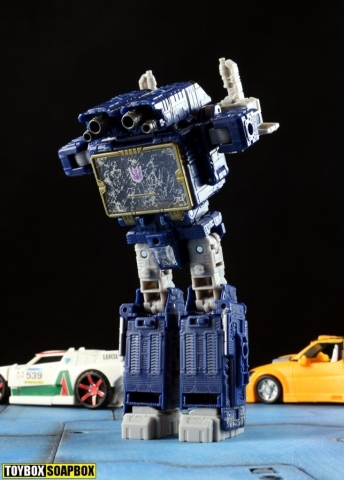 As a way to introduce the “Robots in Disguise” concept straight away it makes sense, even if it’s just a very elaborate lamppost. 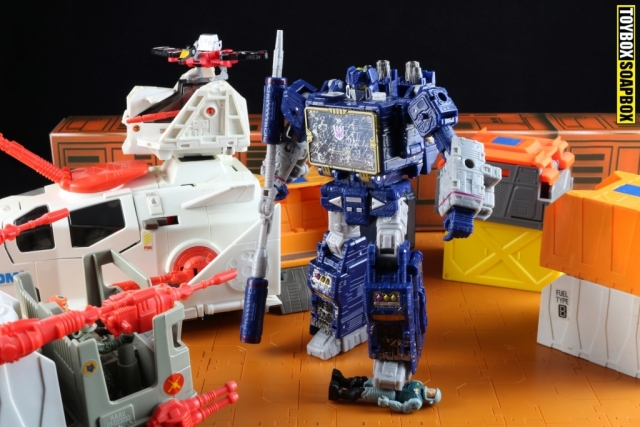 Siege takes this concept and gives it its first official appearance in a toy line as a secret, hidden mode. It’s a fun extra, that possibly usurps the dropship mode, even if the thrusters give the impression that far from being concerned about road safety – he’s more of a free standing flamethrower. Converting Soundwave to the devious face-plated zealot we all know and love is straightforward. 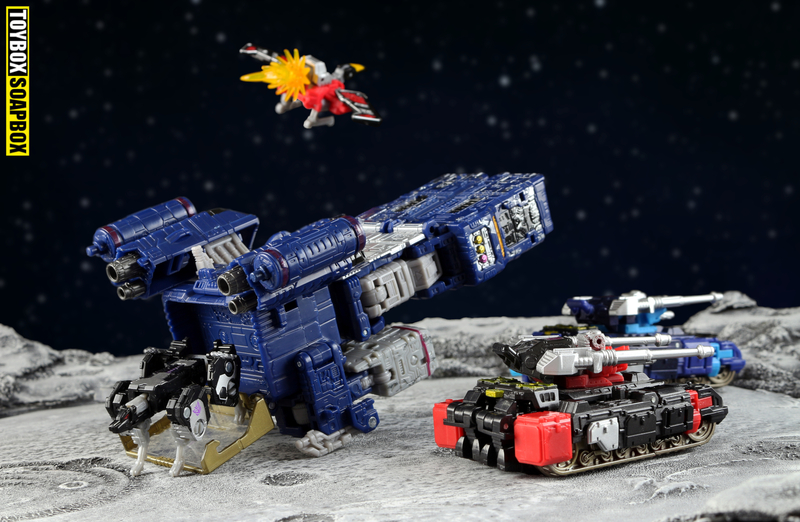 As his spaceship mode is effectively the robot laying down, all you have to do is flip the arms up, rotate the head out and free his feet. A Rubik’s Cube this ain’t. 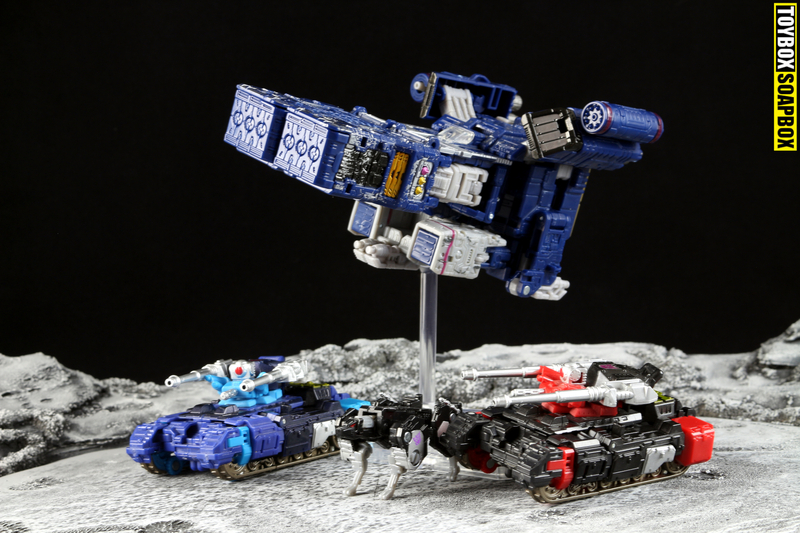 Complexity is thrown out because both his alt modes are simple and don’t stray far enough from the robot mode to require an elaborate transformation. A strong G1 robot is the driving force of this figure and everything else is built around that, including the transformation. It’s an approach that is at odds with so many other figures where the obvious aim is how to stuff a robot into a car. 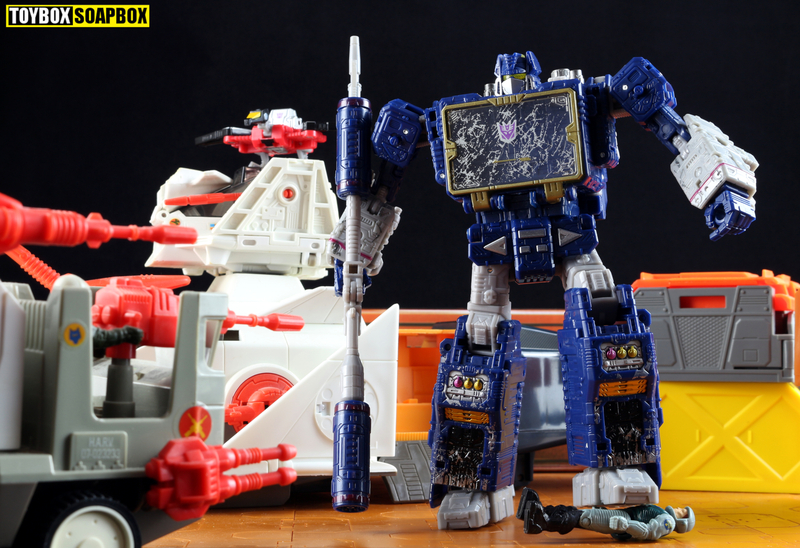 In robot mode Soundwave is every bit the Voyager sized G1 Soundwave you could ever want. He looks incredible, a mini Masterpiece almost. 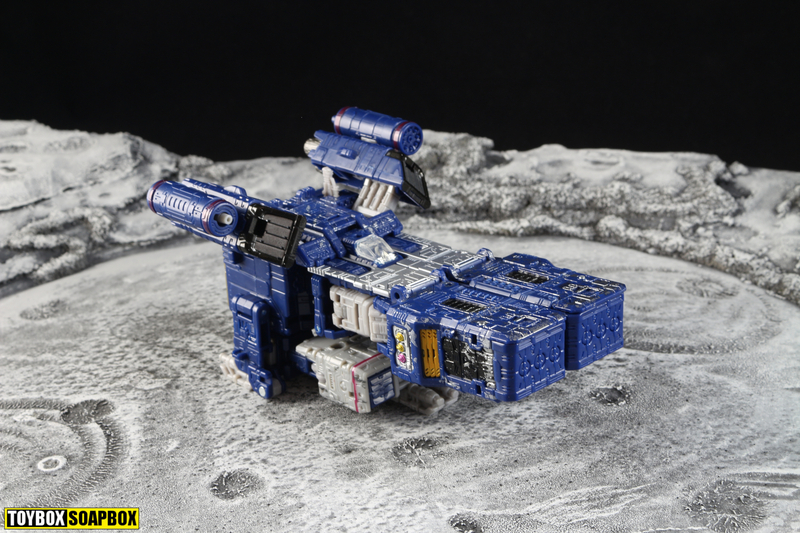 A few Cybertronian elements are visible but this toy largely succeeds in achieving its goal of reconciling the Earth based robot modes seen in the cartoon, with the Cybertronian alt modes that were left to your imagination. Sure, Soundwave’s alt modes might not be the greatest but his robot mode is the angel perched atop the Siege Christmas tree. Lush dark blue, is offset with grey and the occasional dash of gold trim to powerfully evoke the original toy. In spite of the loving glances thrown at the cartoon, the shade of blue used is remarkably close to the vintage toy. Generous use of gorgeous, saturated colours extends to the light piped yellow visor that lives in his amazing headsculpt, which catches light and burns as brightly the Matrix itself. 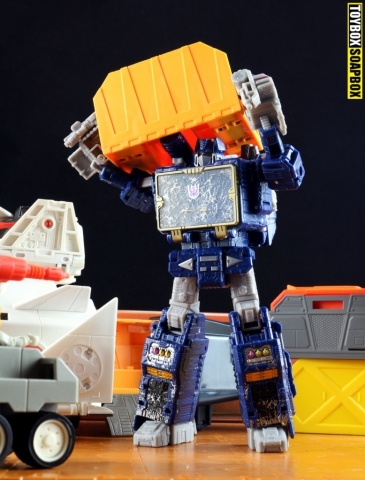 Siegewave also achieves the rare feat of carrying himself with the same weight as his G1 counterpart. His proportions and blocky shapes align in a way where you can see the essence of that character come to life. Not just the surface details, but the personality. As silly as that may sound it’s a thing many toys miss. 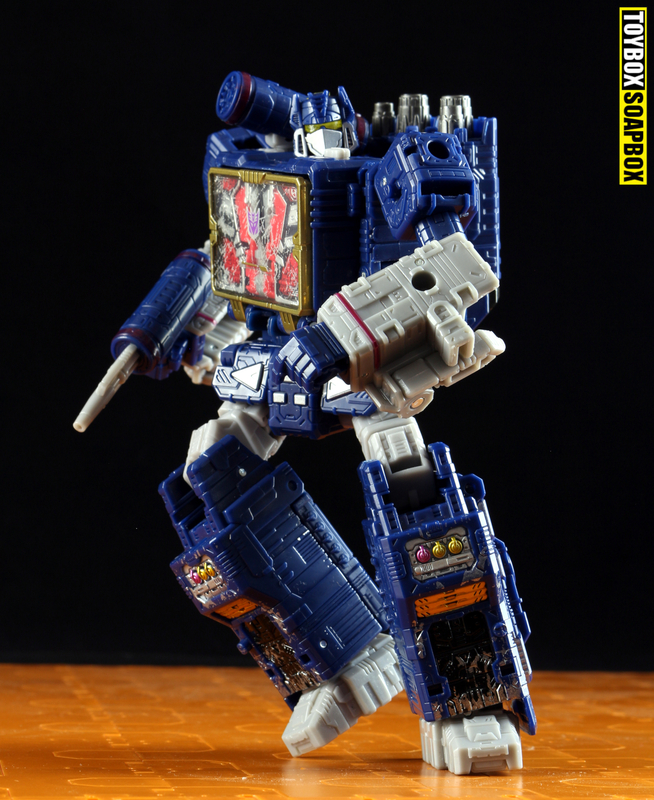 You look at this Soundwave and imagine he walks like he does in the original cartoon, or stands like he does in the cartoon and comics. His arms just kind of hang at his sides in that same way and its a very uncanny thing they’ve captured. Or I’m just bonkers. Off the top of my head it’s tough to think of any part of Siege that has been as divisive as its use of “weathering” paint effects. Some hate it, others…tolerate it, but personally I’ve come to quite like it. My spare room is already stuffed with shelves upon shelves of pristine looking robots, so having something different adds a nice bit of contrast and helps fuel the imagination by reminding me of how some of my childhood toys ended up after their adventures around my Grandparents garden. 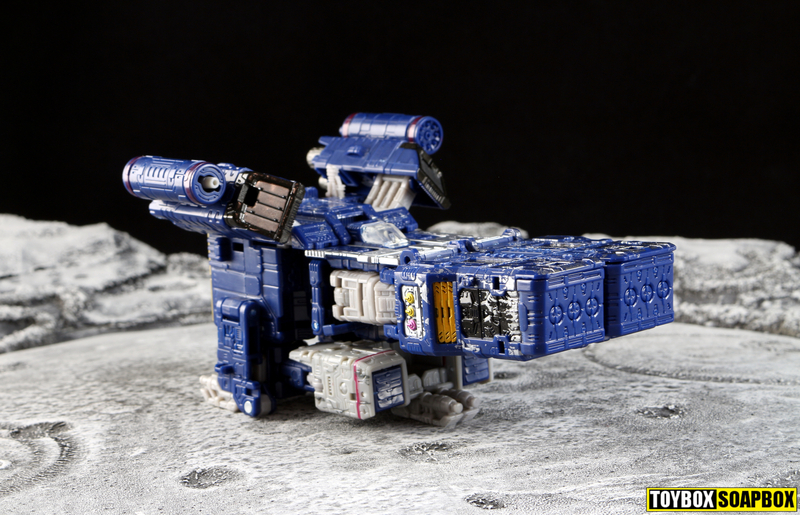 The problem hasn’t so much been the idea of the weathering itself, it’s how half heartedly it’s been applied. Some toys have it on the odd piece whilst the rest of the bot looks like it’s just emerged from the paint shop, for example. 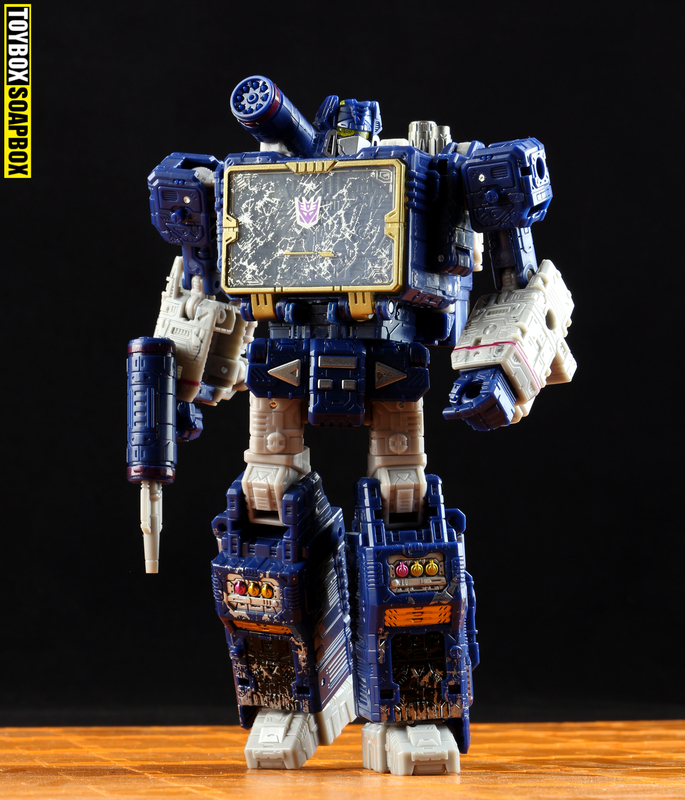 Soundwave fully embraces the idea, perhaps even going a little too far the other way. He doesn’t look just a bit scuffed like the other figures – his shattered chest window suggests he has more likely been through a serious car crash. Or his neighbours got annoyed at the volume of his music, so have keyed his chest overnight whilst he slept. 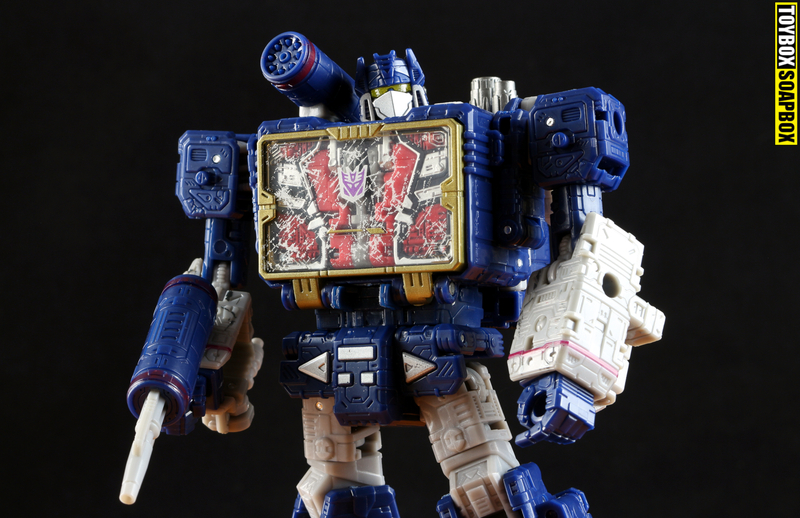 Overall, Siege has not been stingy with paint beyond the weathering effects and Soundwave is no exception. Every detail that needs to be picked out in paint is picked out, giving you the impression that somebody put a lot of love into this toy. Paint applications are always welcome, especially after the trauma of stickering up Trypticon almost sent me to counselling. Had they carried on, I’d probably have even ended up listening to Radiohead – it was that serious. Articulation is another tick in Sieges win column. 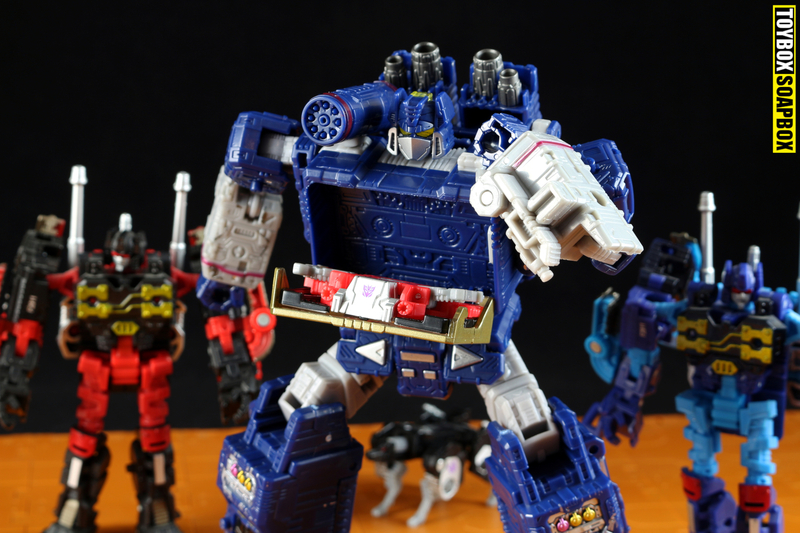 Voyagers always seem to get the best articulation in the various lines anyway, so Soundwave feels the benefit of that. Almost everything is on a ball joint or a swivel (except the wrists) and it looks natural due to his significant chunk hiding many of the joints. 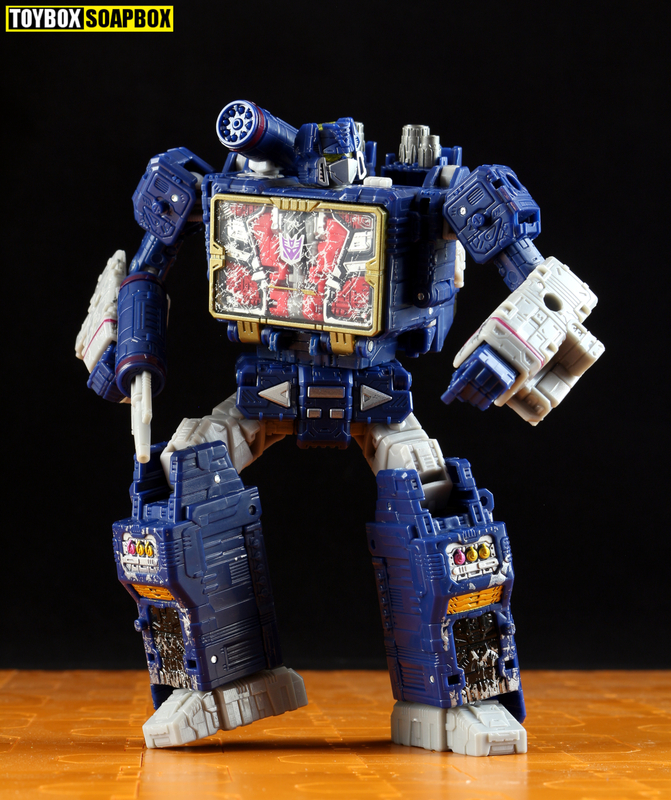 For example, his knees sink into lower legs allows for very Dreamwave-esque posing and his double elbow is partially masked by his angled forearm. As a bot who tends to launch other bots from his chest, in a less grisly Alien fashion, that is important because the pose needs to add to that dynamism. Fortunately he carries himself with a heavy and blocky style that can contort as required. His hips have flaps that move forward individually, allowing him to kick high enough to compete in the All Valley Karate Championships. 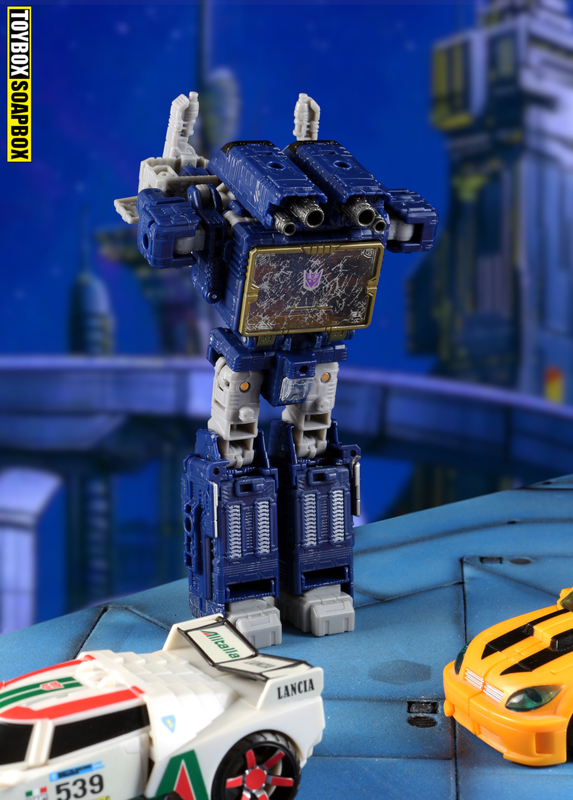 Continuing a now long established trend, Soundwave is able to press his own eject button to open his chest. Quite why he’d need to do this when he can command everything else with his mind is anyones guess, and I shudder to think of why he’d have to press the buttons on his crotch. For your pennies you do get a couple of accessories, one of which makes less sense than an Uwe Boll movie. First the traditional stuff. Soundwave comes with his signature battery shaped shoulder cannon and rifle. 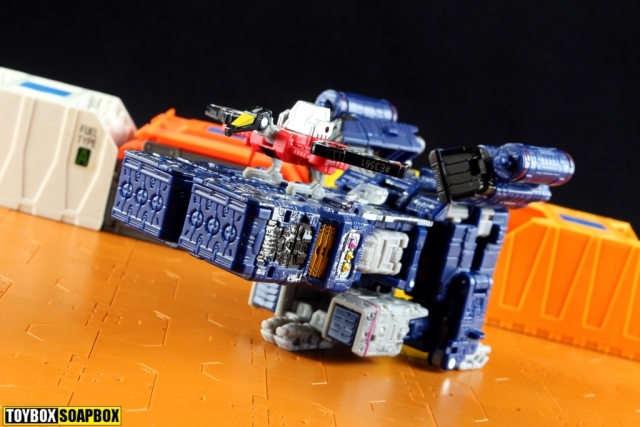 The shoulder cannon has the ability to pivot up and down but can also be held as a weapon or really large boom mic should the urge to get into TV strike him. His rifle has a slide out grey piece in homage to the vintage toys missiles but it doesn’t detach from the gun itself. So far, so normal. But he also comes with a grey pistol that folds out into a javelin that would look more at home in the hands of Fatima Whitbred, had she been eaten by that machine in Superman 3. Its main purpose is to act as a bridging piece between his other two weapons to create a supa dupa sniper rifle cannon thing. In theory it sounds great, but in practice it looks ridiculous and he doesn’t handle it well. In the physical sense, not moping Ultra Magnus sense. 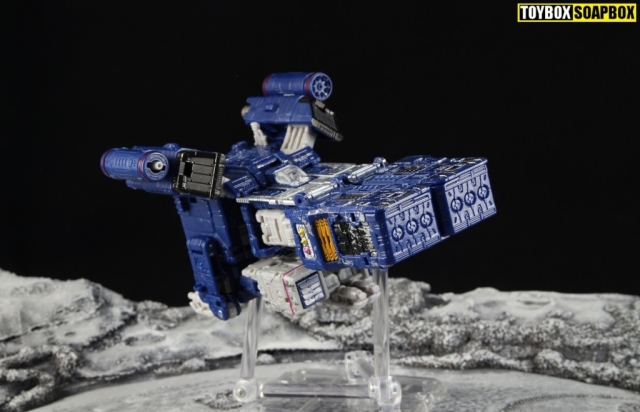 Remove the grey piece and you can still combine the two blue pieces into larger cannon anyway so it really is a pointless piece. Should you want to experiment, a grey peg from the shoulder cannon can pop out and the best use I’ve seen for it so far is as a rocket powered hammer – or polo mallet. 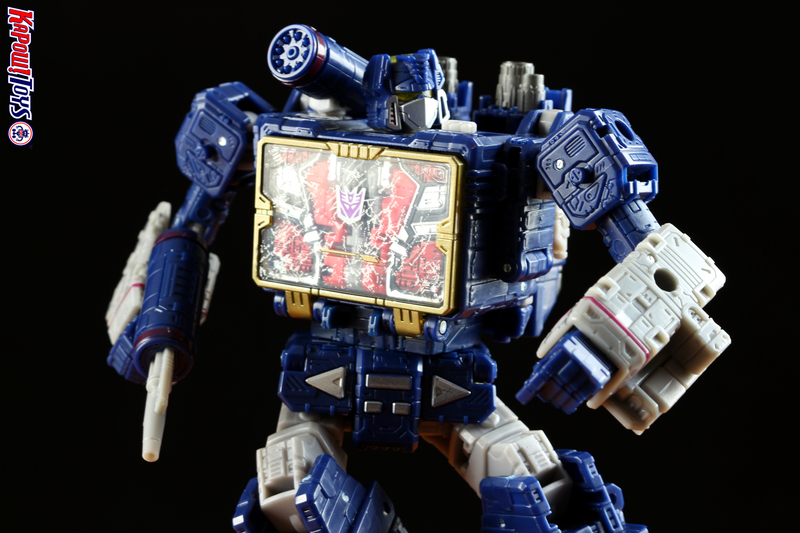 Soundwave is another excellent figure in a line which is proving to be amongst the top tier in Generations. He’s solid, has tight joints and is lathered in paint, which should tick many the boxes on many fans wish lists. 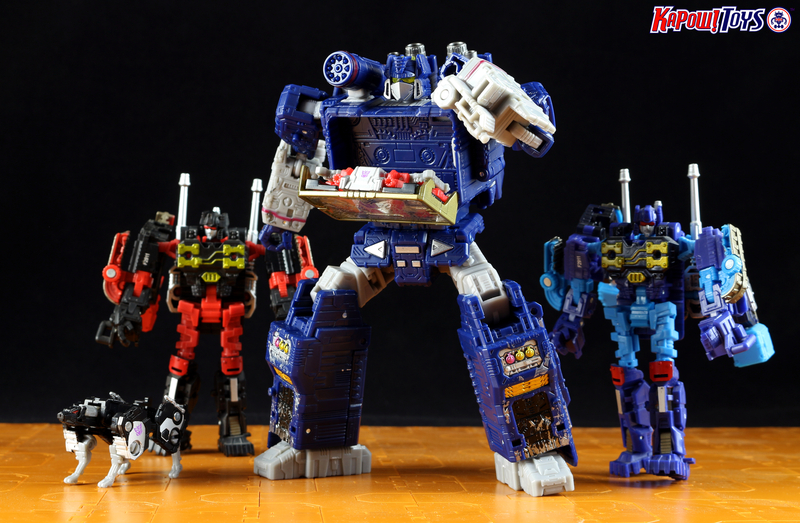 Aside from just being a very good toy, it’s always nice to see that traditional G1 look return – especially when it has so many bells and whistles and fills a long standing gap. 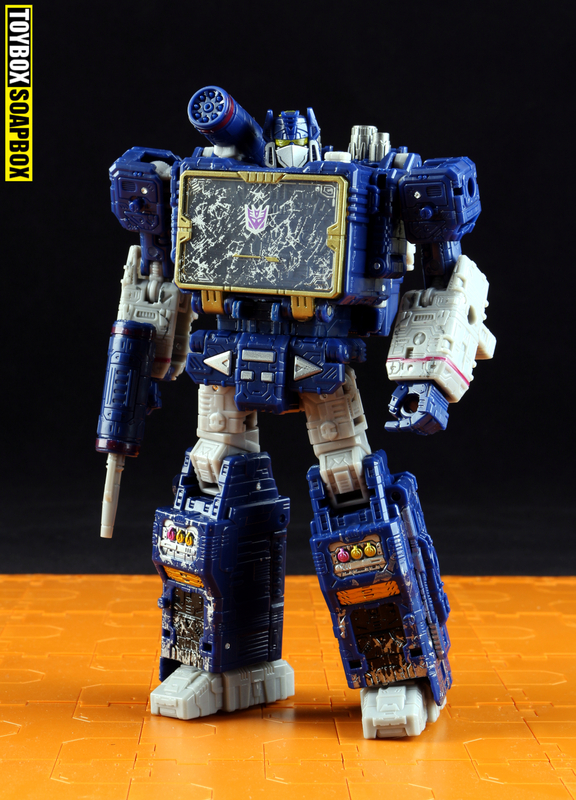 Soundwave has such an iconic look that tends to work in any line, in any generation, regardless of how outdated the tape cassette aspect is. As Siege continues to prove, it’s possible to update the vintage characters without deviating too much from the original designs, to produce modern iterations that are faithful but stand equal to anything of current design. With this toy you may get an awkward alt mode but the spirit of the original character possesses every part of the toy from the looks, the proportions, the details, the personality and even it’s ability to fling small microcassette style robots across your living room. 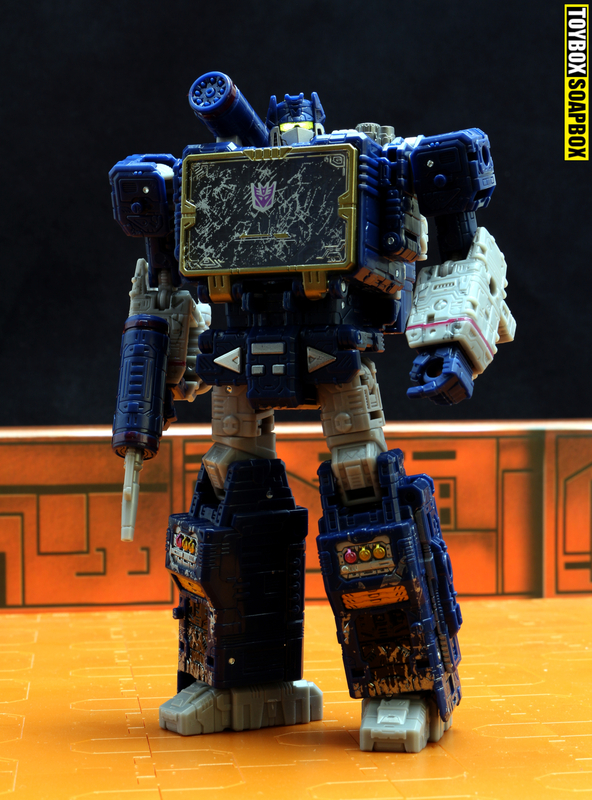 To answer the question posed at the beginning of this article – Siege Soundwave is definitely Superior. I thought there was an unadvertised cassette player configuration? There are a couple of different fan modes, but nothing official.